Today our monastery is celebrating the feast of Bl. Agnes of Jesus Galand, a nun of the Monastery of Langeac, France. Her feast is supposed to be celebrated on the 19th but since here in the USA we have the obligatory memorial of the North American Martyrs we decided to celebrate our Sister today. 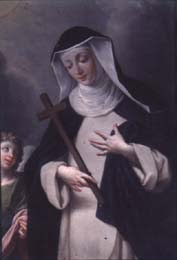 Agnes of Jesus Galand was born in 1602 and lived a short life, dying 1634. She entered the Monasteryof St. Catherine of Siena in Langeac which still exists today and where they actively promote the life and mission of their Sister. Mother Agnes served her community as novice mistress, prioress (getting deposed and then getting elected again!) and in other duties such as sacristan. In 1631, Jesus and Mary interiorly invited Agnes to intercede and pray for a priest she did not know. Three years later, in the monastery parlour she met Msgr. Jean-Jacques Olier, founder of the great Seminary of S. Sulpice and she learned that he was the priest she for whom she was offering her life of prayer and sacrifice. She died a year later, leaving to her sisters her particular vocation to pray for priests. Because St. Louis de Monfort mentions Blessed Agnes in "True Devotion to Mary" she is remembered if only by name by many who have read his work and consecrated themselves to Jesus through Mary as a slave of Mary. Here is what he says: "Without stopping to prove this truth, I shall simply relate an incident which I read in the life of Mother Agnes of Jesus, a Dominican nun of the convent of Langeac in Auvergne, who died a holy death there in 1634. When she was only seven years old and was suffering great spiritual anguish, she heard a voice telling her that if she wished to be delivered from her anguish and protected against all her enemies, she should make herself the slave of our Lord and his Blessed Mother as soon as possible. No sooner had she returned home than she gave herself completely to Jesus and Mary as their slave, although she had never known anything about this devotion before. She found an iron chain, put it round her waist and wore it till the day she died. After this, all her sufferings and scruples disappeared and she found great peace of soul. This led her to teach this devotion to many others who made rapid progress in it - among them, Father Olier, the founder of the Seminary of Saint-Sulpice, and several other priests and students from the same seminary. One day the Blessed Virgin appeared to Mother Agnes and put a gold chain around her neck to show her how happy she was that Mother Agnes had become the slave of both her and her Son. And St. Cecilia, who accompanied our Lady, said to her, "Happy are the faithful slaves of the Queen of heaven, for they will enjoy true freedom." Tibi servire libertas. The Servant of God, John Paul II beatified Agnes of Jesus on November 20, 1994. Bl. Agnes of Jesus, during this year for priests, we ask you to intercede for our priests, that they may be men on fire for God, filled with a desire to serve Christ's flock.